Today at Google I/O 2012, the company revealed its new device — a 7-inch Nexus tablet running Android’s newest operating system flavor, 4.1 Jelly Bean. The pint-sized slate was manufactured by Asus, known for making other Android tablets including the Transformer and the Transformer Prime. The device has a 1280 x 800-pixel high-definition display, made with reading and watching videos in mind. It has a speedy Tegra 3 with a quad-core processor under the hood, front-facing camera for video chat, 9 hours of video playback — compared to the iPad’s 10-hour playback life — and 300 hours of standby battery time. The tablet weighs 340 grams, which is about as much as a paperback. It features tighter integration with Google Play, with content being front and center, similar to how the Amazon Kindle Fire functions. Due to this, Google Play now has a new 3D magazine app with s tablet-optimized articles that renders well on the Nexus 7’s screen. Nexus 7 will also be the first device that ships with Chrome as its native browser — Chrome, despite being Google’s browser, hasn’t been available on Android until a beta version of it was introduced for Ice Cream Sandwich devices. Google has also overhauled Google Maps with additional information and review features which can predict which restaurants you’ll likely enjoy. Offline maps will also be a hotly sought-after feature, and now that Apple and Microsoft are touting similar features, it’s an important bullet point to have. 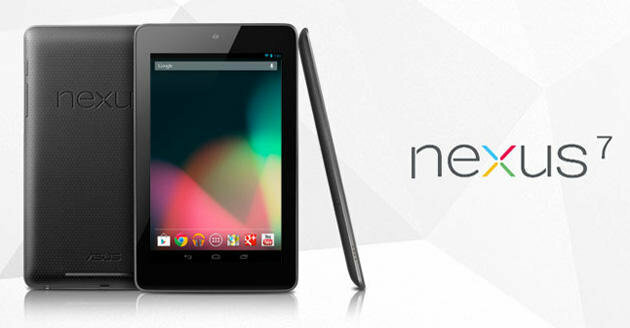 Preorders for the teensy Google Nexus 7 tablet begins today. You can order the new tablet from the Google Play store with two price tiers — $199 for the 8GB model and 16GB version — making it a true Kindle Fire competitor. It will start shipping in mid July. The Kindle Fire lands at a similar price point, but with its apps governed largely by what Amazon declares suitable for its shop, the Nexus 7 will have everything the Fire has, and then some. Despite similar hardware specs — screen size, screen resolution, etc — the Nexus will offer a much more genuine Android experience from a software standpoint. Google is clearly making a play for potential iPad customers with this sleek, streamlined device, and with a price tag of less than half of the base model Apple tablet, the company may have a real shot at success. $499 gets you a 16GB iPad with a 9.7-inch Retina display, but if ultra-sharp screen resolution and a few more gigs of storage aren’t a big deal, the 7-inch Nexus slate will be much easier on your pocketbook. Of course, it’s unclear how Microsoft’s Surface device will shake up the consumer tablet market. With a physical keyboard and Windows 8-esque software design, it seems like Android and iOS devotees will already have their minds made up between the iPad and the Nexus 7.